Tis the season of fresh green peas and while I always have on hand large packet of frozen peas, the taste of fresh green peas is something else. There is an extremely simple recipe - which my friend had shared with me last season, where if you buy large quantities of peas, say 2 kilos or so, you shell them and grind with chillies, ginger and salt, then on a slow flame with a tadka of some cumin, saute this paste with some amchoor powder till quite dry. Store in freezer in small containers and use as a stuffing for parathas to make instant lunches or dinners when required. 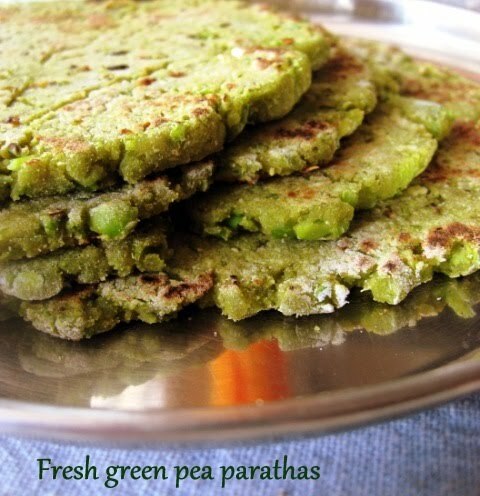 My version is a slight modification on this as I had just a cup of shelled peas on hand, so I ground them, sauteed and mixed in the flours directly to make these green parathas. These are lovely for a hearty weekend breakfast or your kiddies lunch box. In a mixer, grind the first four ingredients to a coarse paste. Take the oil in a non-stick kadai (preferably), heat on medium flame, splutter the cumin seeds, add a pinch of asafoetida to this. Transfer the pea paste to the oil and saute on medium flame with the amchoor powder till nearly dry. The amchoor not only adds a tangy taste but also helps in drying out the mixture faster - due to its astringent quality. For this quantity, the process will take 7-10 minutes. For preparing large quantity of peas-masala to freeze, the procedure is same up to this stage. Just add more chillies, ginger and adjust spices / seasonings. Transfer the ready masala to a bowl. Add the flours and some salt if required and knead to a dough sprinkling some water if needed to bind ( I had to use just a tsp of water of so). Make four balls and roll out gently into thick parathas, using some flour for dusting. Heat a skillet, cook the parathas on both sides on medium flame till golden spots appear, brush with butter or ghee if you like once the sides are cooked. If youd like the masala as a stuffing, then use whole wheat atta for the outer cover and prepare like you would any other stuffed paratha. Serve hot with a chilled raita and pickle of your choice. I love these chunky parathas which have equal quantities of peas and flour, so its a cross between a hara-bhara patties and a paratha. You could substitute other shelled veggies like fresh green tuvar or fresh green garbanzo instead of peas.